I have some strange tendencies about a lot of things – just ask my family and some of my friends. Although, one of the things that I used to think was strange, I don’t think is anymore. In fact, I find it to be one of the most significant ways that I have grown in my walk with God and life in Christ. In every aspect of my life I try to always focus on how God is present and at work in that moment. I no longer believe that God only shows up once in a while or after a period of time when I’ve been especially good or only when I take the time to actually talk with God. As a matter of fact, I’ve come to believe this so strongly, that I now believe God is showing up even when I am not in a place of worship like this. Heck – there are a lot of times when the God I experience inside church buildings has little to do with the God that I believe is being revealed to us through a savior named Jesus. So, a significant spiritual practice for me, that is ever unfolding, is seeking God and trusting that God is present in my life at all times and in all ways. And by all…I mean all. I think some of Jesus’ closest friends may have forgotten, just like you and I do from time to time. Forgotten that God is always present and that we are being invited constantly to discover what that means in our lives in every way possible. Jesus is making some pretty crazy claims in our gospel reading from Saint Luke today. He is talking about the complete destruction of the temple – a building that symbolized the presence of God to the people of Israel for centuries. He is talking about gruesome death at the hands of war and famine and unforeseen disasters. He is talking about a lot of things that don’t seem to resemble the end of a Disney fairytale where everyone lives happily ever after. It’s hard to imagine how God is present in all of that, isn’t it? And maybe even more difficult to trust that God is truly present at times like those. As I’ve walked with Jesus’ words from Luke’s gospel this week, I’ve wondered how you and I would hear these words today. I’ve wondered how people in war torn parts of the world like Syria or the Central African Republic or Afghanistan hear them. I’ve wondered how people in the oil fields of western North Dakota hear them. I’ve wondered how our brothers and sisters in the Philippians hear them – especially today. Is God really present in those places? Can you and I really trust that God is there? If you are sitting in a war-torn neighborhood in Damascus, Syria or a lonely and isolated man camp in Watford City, North Dakota or a remote village that has been completely destroyed by a Typhoon in the Philippians or even if you are comfortably sitting in a Lutheran church sanctuary in Bismarck, is God really present in those places? To which Jesus comes to you and to me and to every child of God in any place in the world, and in the end, says relax. Don’t worry, everything is going to be OK…I’m still here just like I’ve always been and just like I always will be. 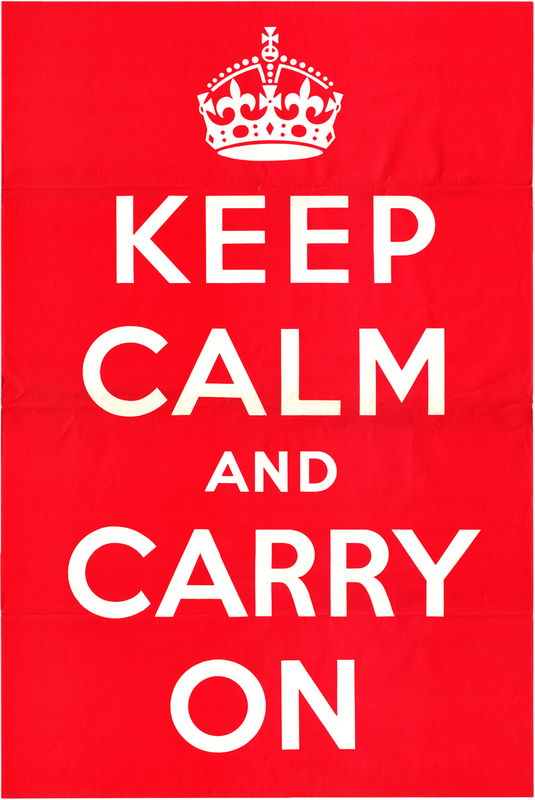 It’s kind of like Jesus is the first one to proclaim the mantra that is floating around everywhere lately – “Keep Calm and Carry On”. Which brings me, and I would guess many of us here today, to one of the biggest problems you and I have with Jesus. He rarely says the things that we think he is supposed to say. You and I long for a Jesus that wants us to just welcome him into our hearts and then all of our problems will go away. Instead Jesus comes to us and reminds us that he will walk with us, even as we endure war and persecutions. In other words, not every day is going to be easy. You and I long for a Jesus that will swoop in from some golden chair in the sky and remove the people we don’t like having around us because we think they are different than we are. Instead Jesus comes to us and says that we will be betrayed, even by our closest friends and family. In other words, you and I will probably be surprised at who God claims as God’s children. Which Jesus do you believe in? Which Jesus do you follow? Needless to say, brothers and sisters in Christ, following the risen savior Jesus Christ is not always easy! Thankfully, it’s not a journey that we walk alone. In Luke’s gospel today, Jesus is telling his friends that following him is not about building big beautiful buildings to worship in. and in following this Jesus, there will probably be times of famine and war or persecution from enemies that may even be our family and friends. Jesus says to his friends that God will be present – no matter what happens in their life in this world. And this week, Jesus was telling me to look around and see the beauty of God’s creation, to feel the unconditional love of God’s warm embrace, and to listen closely for the sounds of a world that is filled full of Gods’ unending grace. Brothers and sisters in Christ, I have no idea what temples are being destroyed in your life or what season of war or famine you are facing or what persecutions you may be enduring today. What I do know and do believe with everything that I am as a fellow brother in Christ and one of your pastors is this – so, hear these words from Jesus again. Jesus says, “Every detail of your body and soul – even the hairs of your head! – is in my care; nothing of you will be lost.” And in the end…that is all that really matters as we live out our life in faith. Thanks be to God. Amen. This entry was posted on Monday, November 18th, 2013 at 2:11 am	and posted in Recent Sermons. You can follow any responses to this entry through the RSS 2.0 feed.